While the Revoltech line, especially the Queen’s Blade series, appears to be dying, there has been a wave of re-releases of previous Revoltech figures under the “Legacy of Revoltech” banner. To me Kaiyodo is screaming and admitting that their clicky joints don’t work too well as newer figures are now in a different scale but the biggest deal is that they don’t have clicky joints anymore. Cattleya is one of the older Queen’s Blade figures which seems to have escalated in value on the second hand market, until this re-release gave collectors a second chance. Here comes the latest entry in the Revoltech Queen’s Blade line. 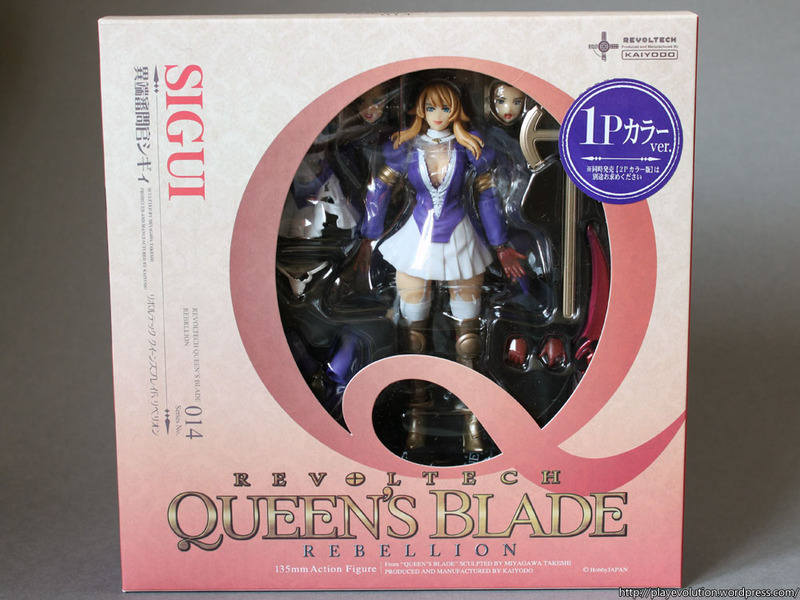 It says Sigui on the box but I’ve seen other materials refer to her with various spellings like Siggy or Shigi etc. The only characters from Queen’s Blade I care about are her and Nyx but they don’t look like main characters since I haven’t seen many figure releases for them. I missed out on their PVCs and they are nowhere to be found second hand. Since the price of the Revoltech figure wasn’t figma-tier and this was likely the only rendition I could get now, I decided to go for the 1P version. Being Revoltech figures I wouldn’t expect too much from them. 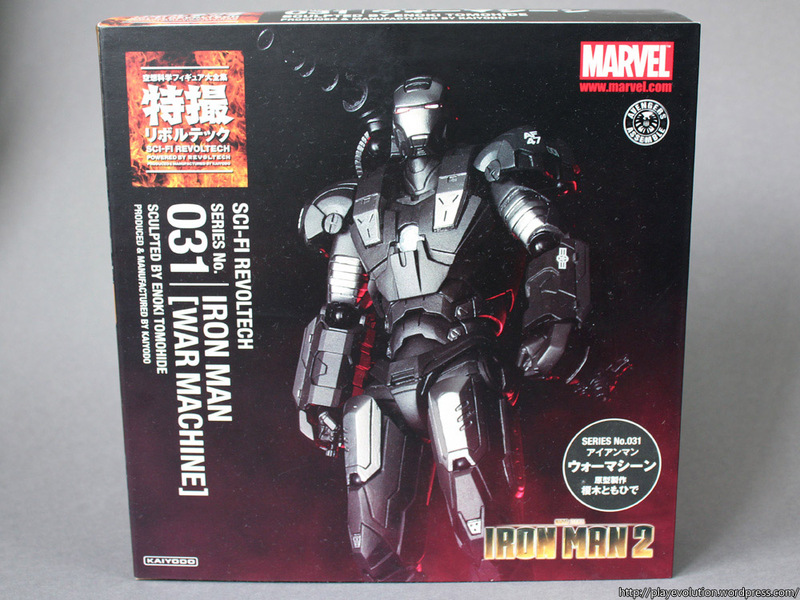 I got Revoltech War Machine not long after my previous loot so his review got queued up. I fiddled with the Mk. VI figure I gave my brother and it looked pretty great so I went to preorder this one. It’s a decent figure but it loses out a little to Iron Man. It’s been several days since my last post. I have been trying to get my hands on some batteries for my dingy old camera, and only today I have managed to 1. get a pair with sufficient juice, 2. set up some space for taking photos and 3. actually take some photos despite my horrendous and hasty photography skills. 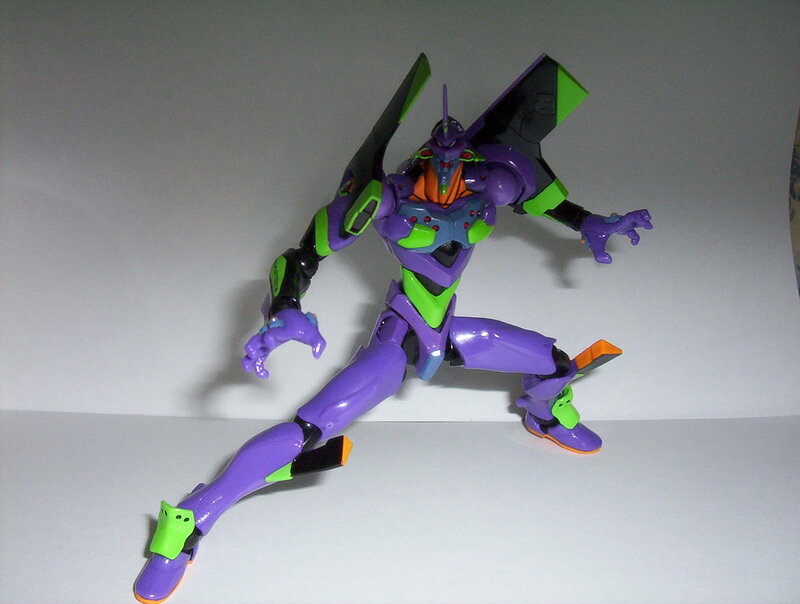 So here are several pictures of my recent get, the Revoltech Eva-01 New Movie Version. I finally know what major disadvantage WordPress has – it has painfully long loading times. It took me 45 minutes to take these photos, and 15 minutes just to insert them into this post, waiting for blank, loading dialog boxes. Also, most pages take ages to load the first time. All accessories laid out. 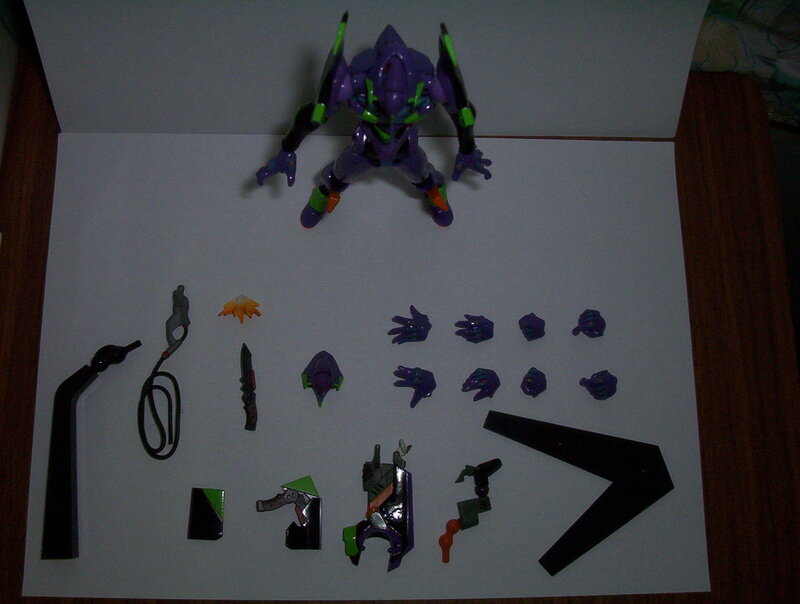 As you can see above, the package comes with a fair bit of things: a stand, umbilical cable, progressive knife/effect part, shoulder scope and extra shoulder armours, extra head (open mouth) and 4 extra pairs of hands. The hands are detailed and fixed-pose. In all, there are 3 pairs of open palms, one pair of fists and one pair for holding weapons. 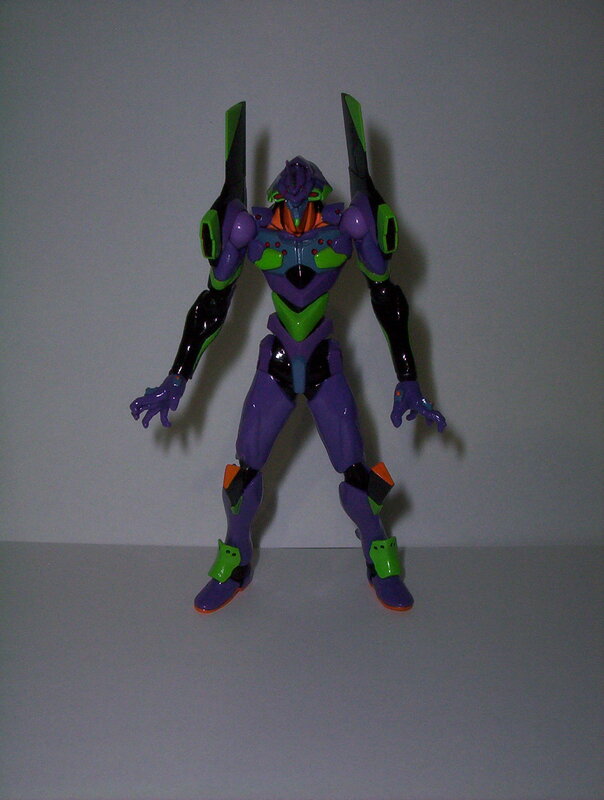 Here’s a shot of the fixed-pose open shoulder armour to simulate the Eva drawing its progressive knife. In this picture you can see the extra closed shoulder armour has a removable bit to simulate the removed knife. A glimpse of the awesome articulation this action figure can do. I totally forgot about a rear view until the end. It takes several minutes of fiddling around between each photo putting the figure into a new pose and replacing the hands (which can be very difficult to remove and put on as the joints keep swiveling in all directions as you try to push the hand into place) and I could only manage these few lousy pictures. I have been having driving lessons this week – lots of boring Final Theory Practices, and more tomorrow (one more Practice and then an Evaluation which I have to pass before being able to take the Final Theory Test), in preparation for my Final Theory Test on 3 October. So here’s a little review of this figure. Overall, the figure is quite detailed in certain areas like the head and hands. 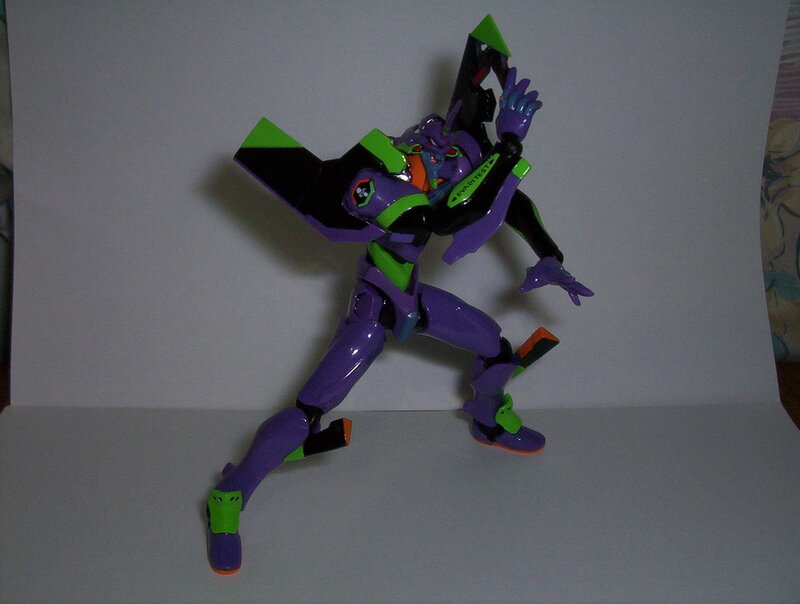 The figure isn’t made from solid ABS so a little flex is expected but in this figure, there aren’t many vulnerable break-prone areas besides the head horn. Numerous extra hands and an open-mouthed head make the figure capable of expressing more emotion. I particularly like the combination of an open-mouthed head and the claw-positioned hands which give the figure its characteristic primal rage look. The stand is merely a cheap-looking standard one that comes with all Revoltech figures. 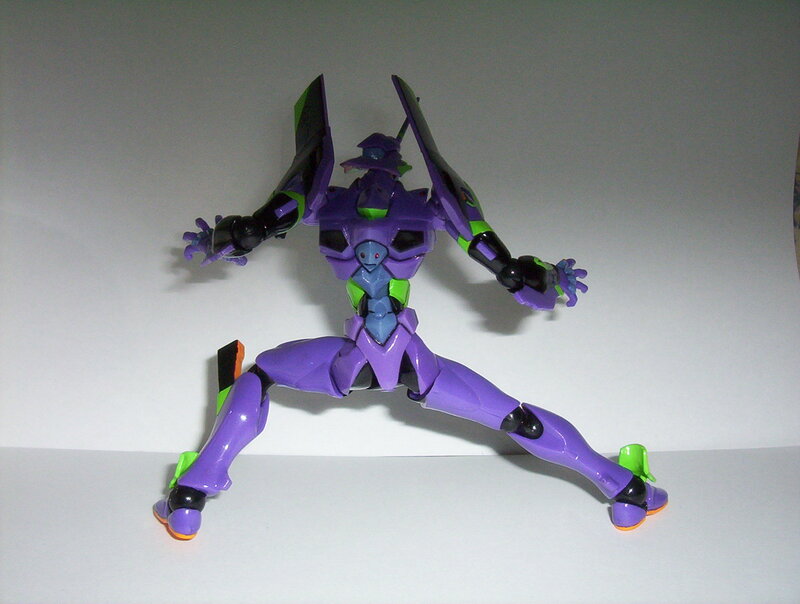 The base plate when used by itself is useful for keeping the figure stable. The Revolver Joints are placed in the following locations: head, neck, shoulders (2), elbows (2), wrists (2), torso, knees (2 double joints), and ankles (2). Great articulation for a relatively cheap figure, even cheaper in my case as I bought it for only $15 SGD. Its design allows its joints to be flexed to a large degree as it does not have bulky armour or bit of clothing blocking the way. One potential issue would be the fact that despite Kaiyodo’s claims of eliminating loose joints due to wear and being able to hold their positions, some of the joints have a little play in them. My figure also has one of its shoulder armours loose. I guess it can be fixed with a little UHU or other not-so-strong adhesive. I would say that this figure is rather good, and if there were more figures that I fancied, I may bust my dough on them too. 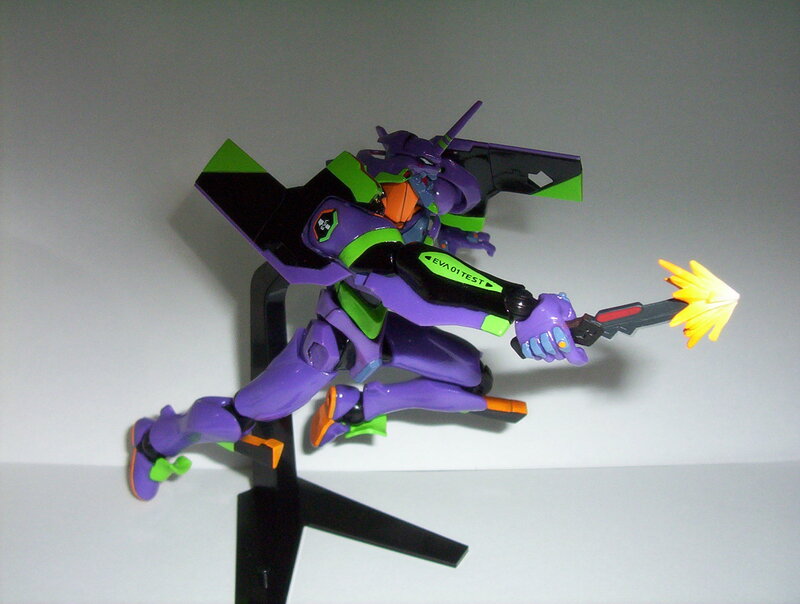 The Revoltech line covers numerous franchises so most people would have their favourite characters/mecha reproduced in the Revoltech format.